A clever design addition enables a growing family to stay in their 100 year old bungalow. The French family had outgrown their modest 100 year old craftsman bungalow. With two tween children sharing a room, a home based business occupying most of the living space, and no areas of retreat, it was time for growth and change! Worried that they would need to leave their well-loved neighborhood to find a home big enough for their increasing needs for space, the Frenches hired Living Shelter to explore options that would allow them to stay in their home. After going through several conventional design iterations for how to expand their space including an attic renovation and addition, the Frenches decided to explore a DADU concept as a possible way for them to add space and more fully embrace what their property had to offer. With adjacent property sloping away to the south, the Frenches’ rear yard had great views and solar access, allowing us to use passive solar design and achieve views of Lake Washington, the Cascades, and Mt Rainier. Building a DADU would also allow the family a future rental income if needed. 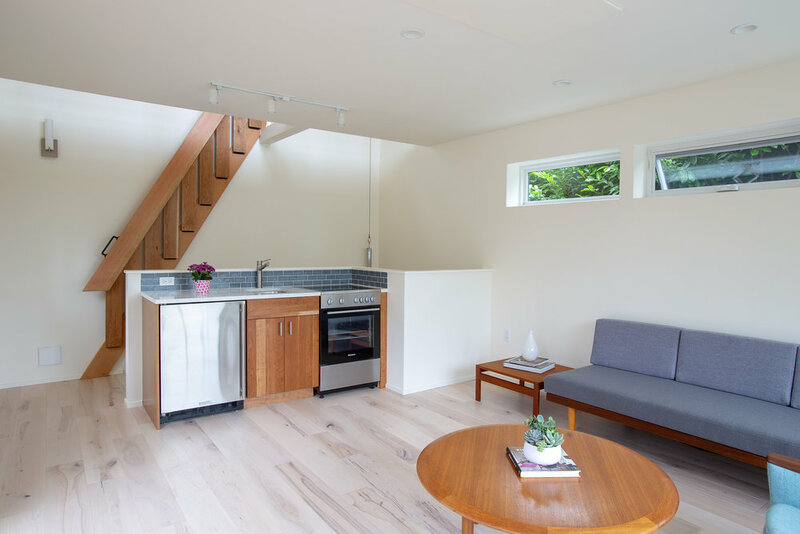 To maximize their small lot, we designed a DADU that connected the main level of their existing home, across a deck, to the main level of the new cottage, where we programed flex space that includes a small kitchen. Down a flight of stairs from there, we set a guest bedroom/workshop and full bath below grade. This room leads out to a newly-created sunken patio through sliding glass french doors, which bring abundant light into a space that otherwise would have been a garden level basement. 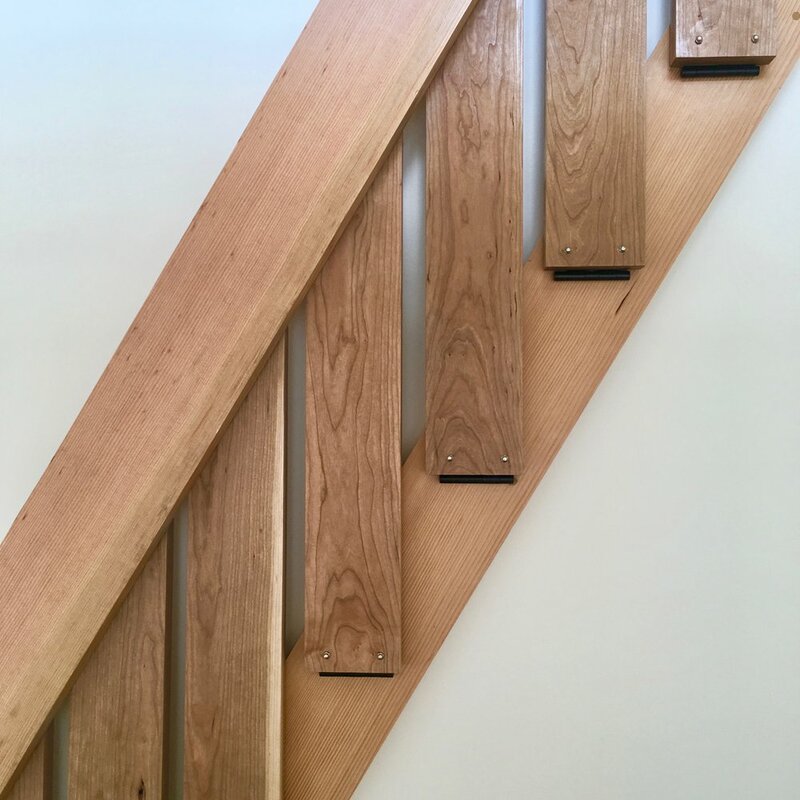 From the main level up, we designed a custom folding stair which uses the space above the lower stair run and gives access to the lightshelf loft space above. That meditative spot allows access to a roof deck with million dollar views of Mt Rainier and the lake. All of this design was layered with deep sustainability through a close collaboration between Living Shelter and the contractor, Mighty House Construction. From the foundation, insulation, and waterproofing, to the floors, paints, and roof, nearly everything in this DADU was chosen because of its low environmental impact and high performance. Another consultant on the project, Lucas Johnson of 475 High Performance Building Supply, estimates the French project is, “Seattle’s first carbon-negative DADU”! The French project exemplifies what a good architectural project can have; great communication and collaborative design, flexible and creative clients, and highly skilled builders. We hope the DADU adds another 100 years to the life of this home.